Writing on Napkins at the Sunshine Club includes a poet laureate of Georgia and of the United States—and the poet who read at President Clinton’s second inauguration. The oldest poet was born in 1905 and the youngest in 1972. The Pulitzer-winning Stanley Kunitz wrote a famous poem about the Ocmulgee Indian Mounds. Miller Williams, father of the Grammy winning Lucinda Williams, lived in Macon in the early 1960s and became friends with Flannery O’Connor. In the late 1970s, soon after his Mercer days, David Bottoms wrote the poems for Shooting Rats at the Bibb County Dump and won the Walt Whitman Award. Jud Mitcham won the Devins Award for his first book, Somewhere in Ecclesiastes, and Seaborn Jones worked with Mister Rogers’ Neighborhood and would later connect, in San Francisco, to one of the last pure lines of surrealism in American expression. These poets were either born in Macon or arrived in Macon at various points in their lives. Between Mercer University and Macon State College, poetry in Macon thrived. Adrienne Bond wrote her seminal poems and organized the Georgia Poetry Circuit. Judith Ortiz Cofer passed through Macon State at the brink of a new position at the University of Georgia and as she was establishing herself in American letters as an important spokesperson for women’s experience. From Bruce Beasley and his hybrid poetics to Stephen Bluestone and his craft in the lyric poem, this book presents a selection of poetry by Anya Silver, Amanda Pecor, Marjorie Becker, and the late African-American poet Reginald Shepherd, who was as well-known at his early death as any poet of his generation. Many of these poets studied with and knew the important poets of their time. Their own poems speak for themselves. Is it any wonder that the Macon which produced the songs of Otis Redding, Little Richard, and the Allman Brothers is also the birthplace of some of the best poetry in recent years? This sublime anthology includes work from such poets as Stanley Kunitz (really!) all the way to the late Reginald Shepherd, with living writers like Judson Mitcham, Kelly Whiddon, and the inimitable Seaborn Jones taking up most of its pages. The selections are generous-¬most of the poets are represented by a dozen poems or more ¬and the scholarship creates a valuable context for this astonishing flowering. Every anthology needs an organizing principle, but the best ones are secretly called Just Plain Fabulous Poems, Folks, and this is one of the best. This anthology is a revelation and a treasure. Cantwell's canny selection of poems displays a diversity of authentic voices which transcends notions of race, gender, and mere regionalism. These works, in fact, are among the best of contemporary American poetry. As a writer and teacher, I applaud this volume for the pleasures it affords and the opportunities it provides. 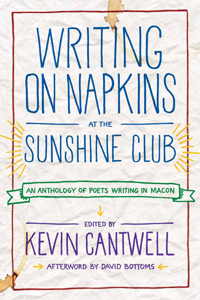 Writing on Napkins in the Sunshine Club is a terrific anthology of poems written by poets touched by Macon, a cotton town and true crossroads, and so a place where poetry flourishes as this collection certainly proves. The strength of this book is that Kevin Cantwell, Macon native and accomplished poet and editor, doesn't select toward a preconceived regional voice, but rather showcases a diverse blend of intimacies from poets anchored to Macon by birth or by some extended, chance interlude, as well as by poets who, passing through, bear away a something intangible from the slow Ocmulgee on the way to other exotic places, usually midway between faith and doubt. Writing on Napkins in the Sunshine Club features outstanding poems from Stanley Kunitz, Miller Williams, and Georgia mainstays Adrienne Bond, David Bottoms, Judson Mitchum, and Judith Ortiz Cofer, and also gathers wonderful gems from under-appreciated yet important poets such as Seaborn Jones and Steven Bluestone, as well as forceful, exploratory work from poets who left Macon long ago, especially Reginald Shepherd, Amanda Pecor, and Marjorie Becker. Two terrific essays, Kevin's introduction and David Bottoms' consideration of Macon as a defining locus for his own poetry, lucidly explore the importance of place in poetry and poetry in contemporary Macon.